Planning a birthday bash for a winter baby? Sure, picnics and pools are off the table, but you’ve still got options — lots of options. 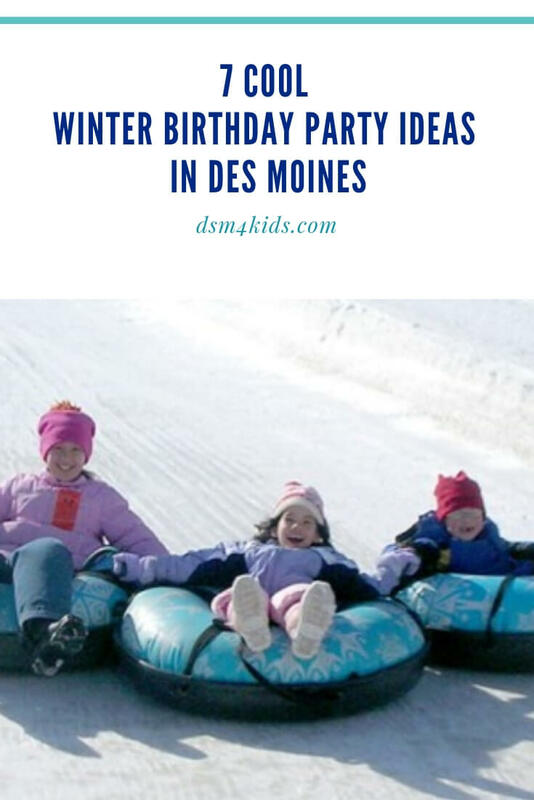 We rounded up seven spots where kids can play and jump, watch a hockey game or be pampered on their birthday this winter in Des Moines. Craft the perfect winter birthday party for your creative kiddo at AR Workshop in Ankeny. Choose from a large menu of youth art projects that includes: painting wood signs, photo frames, canvas wall hangings, decorating pillows and canvas bags. Youth parties include a two hour time slot and the studio will take care of all the project supplies and clean-up. Party guests will get to take their completed projects home the day of the party. Age: No age restrictions. Best for 10 and older. To Book: Call (515) 207-3772 to reserve a time. If your birthday boy or girl is a hockey fan, celebrating at a Des Moines Bucs game might score big with them! The Bucs’ Birthday Bash package includes a Zamboni ride for the birthday kid (Based on availability, so book early!) As well as, PA and video board birthday recognition. Party guests receive an Arena Level ticket, hot dog and soda voucher, Chuck-A-Puck, a visit from Buccaneers mascot Winger and a Bucs mini hockey stick. Age: No age restrictions. Best for 7 and older. To Book: Contact the Buccaneer Box Office by phone (515) 278-2827 or email info@bucshockey.com. Cost: $12.00 per child; $11.00 per adult. A toddler and preschooler favorite, this play emporium has become a birthday party favorite, thanks to a clean space, large guest list and a wallet-friendly price. Des Moines Children’s Museum’s birthday party package includes admission for up to 15 children and a two hour reservation of their party room. Party guests are welcome to play in the museum at any time during their regular open hours. Party hosts are welcome to bring any food and drink they would like to serve at the party. Age: No age restrictions. Best for 1 to 7 year olds. Cost: $125. Additional children can join the party at the punch card rate of $4 per child. Let the kids get the wiggles out at a winter birthday party at Hop-A-Lot DSM in Merle Hay Mall. They have two party room options: one with two inflatables for up to 12 kids and one with three inflatables up to 18 kids. Each party room reservation includes a two-hour room rental, one slice of pizza and one drink per child and a party host. Age: No age restrictions. Best for 2 to 10 year olds. Location: Merle Hay Mall (next to the food court) – 3800 Merle Hay Road, Des Moines, IA 50310. To Book: Complete a Reservation Contact Form on-line. Cost: Up to 12 kids $199 or up to 18 kids $249. The “Fresh Handmade Cosmetics” chain is happy to accommodate a group of “Lil’ Lush Fans” on their big day. Birthday party guests get to make their own bath bomb, try out a fresh face mask and participate in fun and games, while the expert LUSH team takes care of everything from setup and activity coordination to cleanup. Age: No age restrictions. Best for 7 to 14 year olds. To Book: Contact the store by phone (515) 225-1175. Movie theater birthday parties are always a hit – for the kids and parents, especially during the winter months. Cinemark’s Private Screening Birthday Party package provides exclusive use of an auditorium and includes one admission ticket and one Movie Snack Pack (drink, popcorn, snack-size candy) per person with one additional hour of auditorium rental time pre or post movie screening. A minimum of 20 guests total is needed to book a private screening birthday party. Movie must be rated G, PG or PG-13. Age: Depends on movie rating. Best for 4 and older. To Book: Request a quote on-line. Cost: Request a quote on-line. Is your child a diehard snowbunny? Gather up his or her friends and drive them to Sleepy Hollow Sports Park. During the winter the Park makes snow, so kids can sled all winter long. And, what’s more fun than sledding in the winter? Sleepy Hollow offers two party packages, both include a Snowtubing/Zipfy Combo lift ticket and equipment rental; a slice of pizza per party guest and soft drinks or lemonade. Age: For children 14 and younger. To Book: Reserve on-line or call (515) 262-4100. Cost: Three Hour Party Package – $22/person or Two Hour Tubing Only Package $17/person (ages 4-12) $19/person (ages 13 and up). Both require a six person minimum + the birthday child (who is FREE). Where is your favorite Des Moines spot to celebrate winter birthdays? Featured image source Sleepy Hollow Sports Park.